Alternativefuel.com, is a company with internet marketing expertise and proven track record of enrolling new distributors directly over the internet, when you join our team we will help you build your team by enrolling new distributors to your downline. why? because your success is our success and we are committed to helping you achieve you goals. There are two levels of membership Infinity Starter Kit (250PV) and MVP Business Builder Kit (500PV) the costs of each are listed below. The level you choose to join will determine what your commission rate will be and how fast you climb ranks and making thousands or dollars. 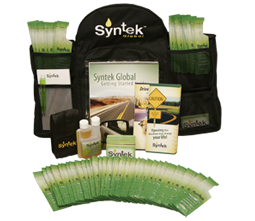 MVP Business Builder Kit (500PV)- $651.00 For the aggressive distributor who is interested in making thousands of dollars with Syntek Global. To hit the ground running with the Momentum of a train and build wealth rapidly you must start with the 500PV kit ($651 USD). Time is money and money is time, let’s get things moving, sign up today!